Now that you have or will soon be tying the knot, it’s time for you and your husband to start giving your home the ambiance that a couple lives there. After all, marriage means things are now split 50/50, and that includes every room in the house. The bedroom is probably the first room you’ll want to decorate as a couple to make it feel more like neutral territory, both of yours, instead of just his or hers. However, deciding what you both will add to the room can be a struggle. You know he is going to want to hang his Godfather poster right where you want to hang your floral décor, so sacrifices and compromises need to be made. While deciding who gets to hang what where and what color scheme the room will be, keep any chance of a battle happening over what goes on the bed and suggest you design matching pillowcases! Matching pillowcases look great with all types of décor because you get to design it the way you want! Plus, it also gives you a cute way of saying a couple now resides here and shares this space! When guests come over and tour your place, they will adore the matching pillowcases signifying you two as an item! 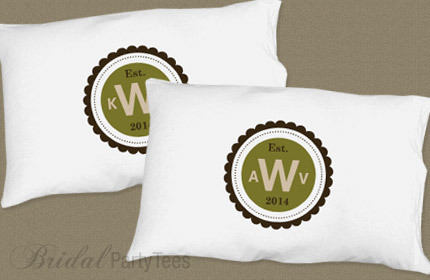 Customize the matching pillowcases just the way you want by adding Mr. and Mrs., your initials, or even upload a photo of the two of you that can be printed on the pillowcase! The sky’s the limit with how creative you can get! 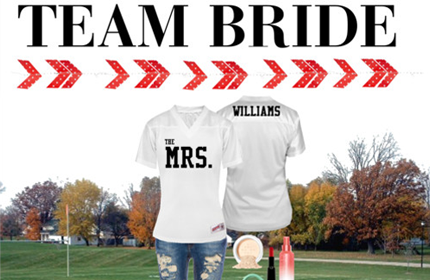 Check out Bridal Party Tees today and begin decorating your new place together as a couple! It would be great to take a trip to Vegas for the weekend to have a bachelorette party, but sometimes that is not always possible. The bride-to-be will want to have her closest friends there for the bachelorette party, and while a big trip somewhere for the weekend would be a lot of fun, it’s not always a practical option for every bride and her group. There’s a substantial cost and time investment involved with planning a bachelorette party of such magnitude and brides are starting to take notice in caution of their guests’ pocketbooks. A new trend we’ve noticed making waves on the wedding front is the low-key bachelorette party! If you’re invited to or planning a bachelorette party where the bride has requested a simpler and more subdued event, check out these ideas for the celebration! If there is a big event going on in the neighboring town or beach nearby, this presents a great chance for the bachelorette party to breakaway from the norm! It not only is a nice change of scenery, but also can turn into a fun day trip that won’t break the bank! Depending on the bride, you can attend a more reserved class such as a cooking class or you can spice things up a bit! If your group is bold and looking for some bachelorette fun, choose a pole dancing class to join for the day! Go out for a nice dinner and after dining on good food, bring all the girls back for a night filled with fun games! Games like truth or dare, Pictionary, Barbie Dream Date and prank phone calls are all must-haves for the big night in! Plus, if the adult beverages are flowing, why not turn it into a sleepover! While one of the more obvious low-key bachelorette party ideas, a pool party is something that many brides will enjoy. Decorate the pool area, have fun cocktails and finger foods for a day or night of water fun! As the wedding date draws closer, the bride and wedding party will need a break from all the wedding madness and nothing can relieve stress better than laughter! Take the girls out to local comedy club where everyone can have a good time! If the bride and her guests are fans of great wine, making a trip to a winery that is nearby can be a great way to relax and enjoy everyone’s company! Plus, you can enjoy the outdoors and experience new wines and flavors! If your bride is more of a beer girl, you can find a local brewery and taste some new beers instead! 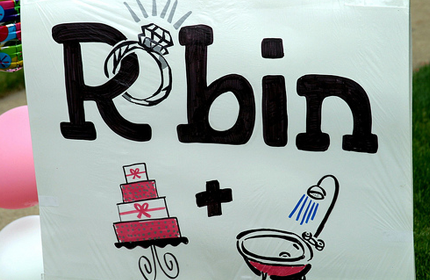 What are some great low-key bachelorette party ideas that we missed? Comment below and share your ideas with us! 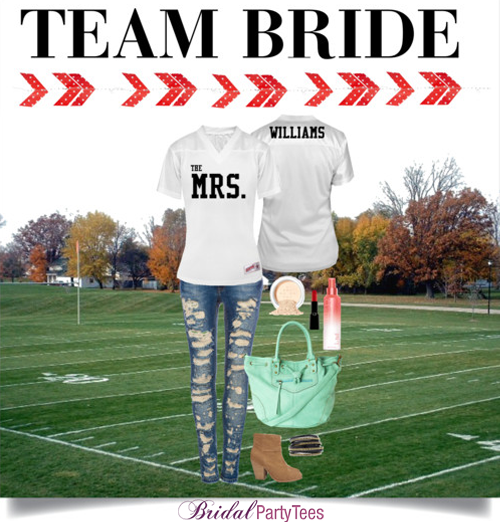 Here at Bridal Party Tees, we’re all about making sure you have a variety of bachelorette party shirts to choose from, as well as providing you with the hottest styles and trends out there! So when we noticed the popular phrase, “hot mess” beginning to surface, we knew we had something our bachelorettes would love and just had to incorporate it into a new bachelorette party shirt design! Since the bride-to-be will have her girlfriends along for the ride the night of the bachelorette party, we also had to add something more to the ‘”hot mess” phrase in order to give it that group vibe! So we’d like to introduce to you our new ‘”hot mess express” bachelorette party shirts for your last night out before tying the knot! What do you think of when you hear “hot mess express”? We picture a fun and wild bachelorette party taking the night by storm and celebrating with a few adult beverages and trains! Trains? Yes, trains! 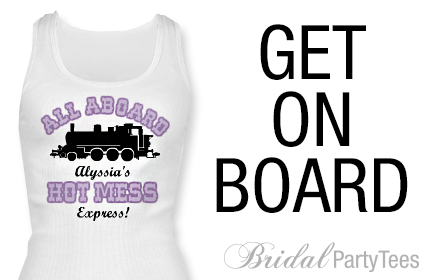 Because it’s all aboard the hot mess express when you wear these bachelorette party shirts out! You’ll love the selection of cute train art that we have available for you to complete your “hot mess express” look! These shirts will definitely set the good vibrations chugging along and get the night started on the right track, that is until later, when it’s time for the hot mess express to get off the rails! Everyone has a favorite movie, but do you love that movie so much that you would marry it? Well, some couples do and they choose to make it a part of their wedding as the theme! 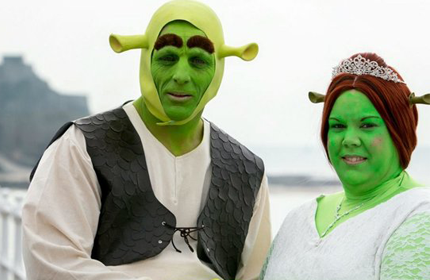 Lately, Shrek themed weddings seem to be getting a lot of attention. Shrek isn’t your typical love story of a movie, but maybe that’s why many people are drawn to it! The romantic tale of an ogre who didn’t care for anyone until he was sent on a mission to rescue his princess in distress is a story unlike any other! There is just something romantic about two ogres getting hitched! Your save the date announcement will be the first glimpse your guests will get of your wedding. It will build anticipation for the wedding invitation that will follow and of course, excitement for the wedding itself! The best part about creating your save the date announcement, is that you and your soon-to-be husband get to show off your personalities, whether that’s putting a goofy spin on it or keeping it focused on the love you share! Whatever direction you choose to take, chances are it will include a photo of the two of you doing something clever with the date of your wedding. We’ve seen everything from announcing the date of your wedding using a sign, spelling it out in chalk, or our personal favorite, on custom save the date shirts! At Bridal Party Tees, we’ll make creating your custom save the date shirts easy so you can focus on the other parts of your save the date announcement. 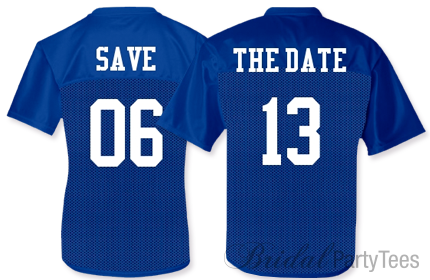 Just choose the save the date jersey or shirt you both like, add the wedding date, and you’re all set to have the best save the date announcement ever! How are you planning to announce the date of your wedding? 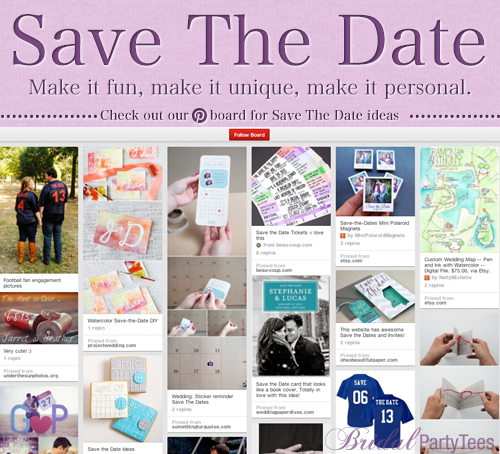 Every bride wants a save the date announcement that will knock the socks off her guests! She wants her save the date announcement to immediately claim a spot on the fridge in order to build anticipation for the big day! However, creating that wow factor for the save the date announcement can be overwhelming. There are so many directions a bride could go for the save the date announcement, that it is sometimes better to see what other brides have done. Here are some of the best save the date ideas and concepts we’ve found including custom save the date shirts, save the date picture frame, save the date tickets, save the relationship timeline and much more. 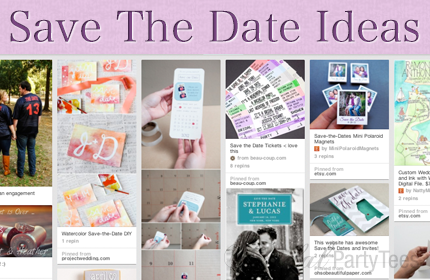 See all of the save the date ideas on our Pinterest board! It happened. You finally have that ring on your finger and are making plans to marry the person of your dreams! 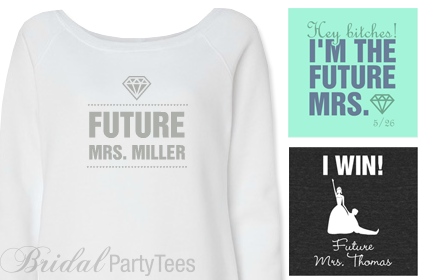 While you count down the days to your wedding, start celebrating now with a custom future Mrs. shirt and outwardly show off your soon-to-be last name! Your future Mrs. shirt will catch the attention of your friends and families while still building up the anticipation of the ring reveal, something every bride loves to do! After seeing your shirt, they will instantly know he popped the question and demand to see the ring! With such importance focused around the engagement ring, we knew we had to offer wedding ring and diamond art in our design center for you to customize your future Mrs. shirt with! If you’re not sure where to start, check out the designs we have available and begin there! You may think diamonds are your best friend now, but just wait until your custom future Mrs. shirt arrives! It’ll be your new favorite outfit to wear during your entire engagement! Which one of our future Mrs. designs is your favorite? With the honor of being a member of the wedding party comes the fun responsibility of planning the bachelorette party and the bridal shower! The bachelorette party is usually the easier of the two because all you really need are some creative bachelorette party shirts, party accessories and beverages to keep the celebration going! However, when it comes to the bridal shower, a little more thought and planning is needed. In fact, there is one very important part of a bridal shower that can make it an especially memorable event. Food and gifts are essential, but it is the entertainment and games that complete the affair! If you are planning a bridal shower and need some ideas for games to play, we have selected some of our favorites that will keep the day lively and fun. This is probably the most classic bridal shower game to play, but it is still a good one! Divide the guests into groups of about three or four and give them rolls of toilet paper. Explain to the guests that each group needs to create the most beautiful wedding dress they can out of the core material, toilet paper! They only have a short amount of time to impress the bride who will be the judge of which team created the best dress! About two weeks before the bridal shower, contact the groom and ask him about 15 questions related to himself and his relationship with the bride. You can ask romantic questions like, “Where was your first date?” or “Who initiated the first kiss?” but don’t forget to include questions that would generate a funny answer too! Try asking him questions like, “If you could throw away anything that your bride owns, what would it be?” and if you can, videotape the groom’s answers! Then the bride can’t question whether the answers were his or not, you have the proof to back it up! To take things up a notch, have the bride chew bubble gum while answering the questions and with each question she gets wrong, she has to add another piece of gum! It’ll be a true testament to how well she knows the groom, plus it will be hilarious to watch her try to answer questions with a mouthful of bubble gum! If you’re looking for a game that involves the guests a little more in order to break the ice, try this one! Have each guest introduce who they are and provide three stories about the bride, two of which are true and one that is a lie. The person who correctly guesses the lie will receive points toward their score. Whoever has the most points by the time you have gone through everyone wins a prize! Not planning on handing out prizes? No worries! This game is fun enough to just sit back and enjoy all the stories being told! In most cases, you’ll find the true stories are the funniest and most entertaining anyway! On an index card, write down some of the most outrageous things that could go wrong at the wedding. For example, “What if the wedding cake accidentally gets knocked over?” or “What if a relative gets drunk and starts telling embarrassing stories about the bride?” Once you have a number of scenarios that could go wrong at the wedding, hand a card out to each guest and ask them to write what they would do to handle the situation they are presented with. Collect the cards and read the responses out loud to the group. If you came up with some funny scenarios, you should get some funny responses back! These are just a few of the many bridal shower games out there. What are some of your favorite bridal shower games?